I would start 17th for my last race of the year, having dropped back in the previous race after a silly mistake, but that’s what the first season is for! I knew I could make ground back up to where I should have started. Off the line I gained two positions quickly, coming past Clive Chisnall and another driver. I got myself in a good position, in the second group in the race. I was again having a good battle with Scott Leach and Seb Fisher. The battle continued for a fair amount of laps. However, one lap coming up to Coppice, it would all change. I was following Scott and Seb into the braking zone with a small gap to them in front. I saw both of them lock up and start to go straight on. As I went on the brakes and locked up, the car started to rotate. I immediately tried to think of what had happened; within a split second, the only conclusion I could come to was that oil had been dropped. This saved me from entering the gravel on the outside, where half the field were either stuck or just about getting out. I managed to skirt around the outside having come off the brakes so I could actually turn. I knew that this would’ve promoted me up the grid. I got back to full throttle, knowing I had to make the most of this opportunity. The race was red flagged, and we were sat on the grid waiting to be re-gridded. Everything then became abnormally quiet. Having been racing at full pelt for the last 10 minutes, it was strange to be then sat on a reduced grid in what was silence apart from idling MX-5s. The only way of knowing what was happening was by listening to the race commentary through the speakers, which I could just about hear. I learnt that some cars wouldn’t be able to continue and it also gave me a timescale as to when the race would get started again. After what felt like half an hour of sitting in a car doing nothing, with some drivers actually getting out, we were finally re-gridded. My position on the grid was now a lot better, as I’d made ground not only from the previous start, but the oil spill had promoted me considerably. I started in what I think was about 9th or 10th, alongside Marcus Bailey. My start wasn’t to be the best. I had to remain on the brake because I was on a slight incline. If I came off, I would be rolling, and risking a false start. The start was a slow one, as the car bogged down, but I held my position, from Jack Moody behind. The rest of the race would be a quiet one with me breaking away from the group behind and being just a bit down from the front group in 6th. The only car to pass me was Mike Comber, I didn’t really mind this though, as Mike is a very quick driver, and I thought I could take the oppotunity to learn from his driving, I was amazed to see how late he braked into some corners, and then still got it turned in. The race ended. 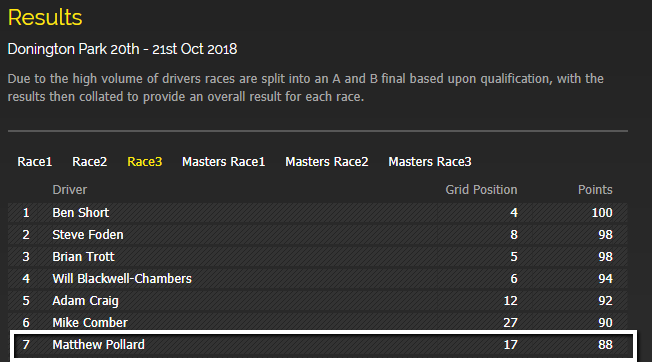 My best finish of the season in the BRSCC MX-5 Championship with a seventh place in the A race. The team were there to give me the thumbs up which I appreciated, I made my way back to the paddock, parked up, got out and realised that was it for the year. I was more than happy though. I’d gone out on a great high. Previous Post: OOPS… I’VE SNAPPED THE EXHAUST! Next Post: BRSCC MAZDA MX-5 CHAMPIONSHIP 2018 – HOW DID I DO?